ALL BED LINEN / TOWELS & WIFI internet INCLUDED. Immaculate 3 bedroom, open plan home nestled among established palm trees giving you a tropical beach feel with large yard, PRIVATE courtyard, BBQ and outdoor dining. BONUS FEATURES INCLUDE, unlimited WIFI internet coverage within the entire property PLUS Linen & Towels, unlike most other properties. LCD TV's in EVERY bedroom & lounge, ALL with FREE access to 100's of movies & TV series, (including the latest new releases). Blu-Ray player in lounge & single bedroom, split system for heating / cooling & fully equipped kitchen with DISHWASHER. The house is non-smoking, however smoking is permitted outside the residence. The property is within walking distance, less than a 2 minute drive to the only patrolled beach in summer, shops, local Restaurant / Bar with the use of the bicycle track between Tarwin Lower and Venus Bay - only metres from the door! Ample parking for your vehicles & boat trailer. VENUS BAY has limited mobile service with Telstra being the only main service provider. Sleeps 5 - 2 double beds, 1 single bed, all freshly made up for your arrival. ALL BEDROOMS have LCD Television with FREE access to 100's of movies & TV series, (including the latest new releases). Private courtyard with BBQ and outdoor dining. Lounge with LCD Television and Blu-Ray player also with FREE access to 100's of movies & TV series (including the latest new releases). Fully equipped kitchen with Fridge/Freezer, Oven, Microwave & DISHWASHER. Split System Air-Con / Heating, and ceiling fans. Separate Laundry with own access to yard and clothesline. 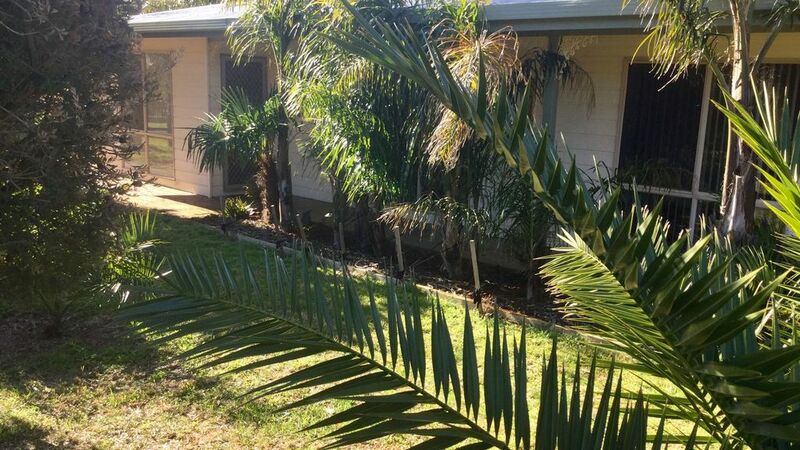 Large yard, great for a game of cricket, footy or just pull up a chair under a palm tree & relax. Located in the first estate of Venus Bay this property provides easy access to surf beaches, Andersons Inlet, bicycle track and the Tarwin River, PLUS all the shops and sites that Venus Bay has to offer. Venus Bay is approximately 160km south-east of Melbourne & can be reached by following the Bass Hwy. Along the way you will pass the turn off to Philip Island & drive through the coastal towns of Kilcunda, Wonthaggi and Inverloch, making your drive very easy with lots to see and do along the way. Bush Walks, Bike Rides, Fishing, Swimming, Surfing, Sailing, Golf, Bird Watching, Scenic Drives. Kangaroo lookout plus many more. Visit the Community centre with holiday activities. Walk to children's playgrounds or relax at the Cavity Bar / Restaurant in the main strip of Venus Bay's first estate. Explore nearby national parks and historic locations, including Wilsons Prom and the lime kilns at Walkerville and the Bunarong Coastal drive between Inverloch and Cape Patterson. WIFI INTERNET coverage within the entire property. FREE access to 100’s Movies and TV series. Property is located is within a 2min drive to main shops, Bar / Restaurant & Beach. For the "PERFECT STAY IN VENUS BAY" get your booking in today. FOR SAME DAY BOOKINGS GO TO A I R B N B...& look for this property. ALL BED LINEN & TOWELS INCLUDED . WIFI INTERNET within the entire property INCLUDED . AMPLE PARKING for your vehicles & boat. FREE access to 100’s Movies and TV series. Property is located within 2min drive to main shops, Bar & Beach. WIFI INTERNET coverage provided within the house & entire property, unlike most other properties. (This is a BONUS should you not be with Telstra) VENUS BAY has limited mobile service with Telstra being the only main service provider. ALL BED LINEN & TOWELS PROVIDED. Ample parking for your vehicles & boat trailer FREE access to 100’s Movies and TV series. Property is located approximately 1min drive to main shops, Bar & Beach. Plenty of parking for cars & boat should you have one . Unlimited high speed nbn WIFI internet included. Standard electric kettle with complimentary tea, coffee & sugar supplied. LCD TV's in Loung & ALL bedrooms, ALL with FREE access to 100's of movies & TV series, (including the latest new releases). LCD TV's in ALL bedrooms & lounge, ALL with FREE access to 100's of movies & TV series, (including the latest new releases). Great little house. Very well set up. Very neat. Value for money 10/10. Had a great weekend on the beach. Kids were exhausted every day. Will be back. Drew's place was great. Very comfortable and clean with the facilities we required for a beach stay trip. We found Drew’s beach house to be perfect for our young family of 5 (including a baby). It was very well set up and all the little touches were appreciated. We enjoyed exploring Venus Bay and it was a good base for trips to Inverloch and Wilsons Prom. Great house and fantastic location. Drew's house had everything we needed for our holiday. It was super clean, comfortable and everything in the house was high quality. Loved the TVs and relaxing paved outdoor area. Walking distance to the shops and fantastic pizzas. Peaceful in the off peak season. We will be back!!! Drew's property way very clean & had everything we needed to enjoy our stay. One of the days was very hot and the air conditioner handled the heat well! Thanks for providing the porta cot and highchair, it was greatly appreciated. Complete WIFI internet coverage within the entire property. VENUS Bay has limited mobile service with Telstra being the only service provider.